Along with many others we will be protesting against Trump’s visit to Britain, and his horrendous policies, on migrants, climate change and so many other things. There will be a local protest at Speakers’ Corner (the Brian Clough statue) at 5.30pm on Friday 13th July, followed by a giant conga round the Market Square. There will also be a coach going to London – see https://www.facebook.com/events/185619325480065/ for details and to book tickets. Drug companies can charge runaway prices because new drugs are protected by legal monopolies. This model has made the pharmaceutical industry the most profitable in the world. The companies justify high prices by claiming they need to recoup their research and development costs. But nine of the top ten pharmaceutical companies spend more on marketing than on research and development. And the majority of innovative early-stage research is actually publicly-funded. 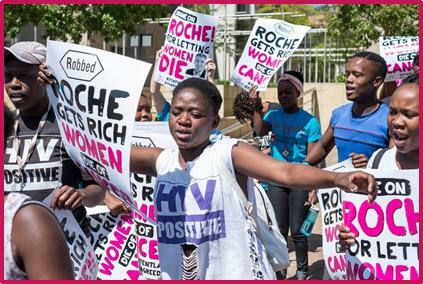 We say it’s time to put people before profit in the global drug industry. Playing Corporate Monopoly at the Nottingham Green Festival. 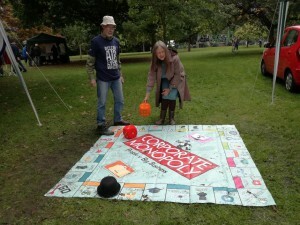 Like life it’s rigged in favour of corporations, but sometimes the little people win. We will be screening the film Precarious Trajectories, followed by a discussion with the director, Simon Parker, on Monday 19th June from 7:30 to 9 at the Friends Meeting House, 25 Clarendon Street, Nottingham, NG1 5JD. All are welcome. The film is set on location in Libya, Italy and Greece during 2015-2016, at the height of the Mediterranean migration crisis. It focuses on the perilous sea crossings that hundreds of thousands of refugees have undertaken in recent years in order to arrive at what they hope will be the safer shores of Europe through the eyes of Ruha from Syria and Ahmed from Somalia. Hope Not Hate put this training on for us on 25th February. This was excellent training, covering techniques for empathetic listening and socratic questioning. We will be following it up by activities in Nottingham, including campaigning to persuade Marks and Spencers to stop advertising with the Daily Mail, which is relentlessly negative about migrants.  Join activists and campaigners from Global Justice Now for a day of discussion, debate and opportunities to plan concrete campaigning activity. Plus updates on trade justice, the politics of migration and local campaigning. With activists from Global Justice Now groups in Leicester, Nottingham, Derby and Northamptonshire. To book your free place sign up at Eventbrite or phone Mary Steiner on 0115 922 6702 to let us know you’re coming. Drinks provided. Feel to bring your own lunch, there are also plenty of places nearby to buy food. We meet monthly to plan actions and events. Our next campaign meeting is on: Wednesday 1 May, 7.30pm at: The Salutation, Maid Marian Way, Nottingham, NG1 7AA.